You've seen aquarium programs before, but you've never seen anything like this! Marine Life so vibrant you won't believe your eyes. Indescribable realism! These fish are actual 3D Models, not flat images dragged across the screen. Marine Aquarium 2.6 also contains two new fish for your enjoyment. The Clearfin Lionfish and Achilles Tang round out the fish population to twenty eight unique species of underwater life. 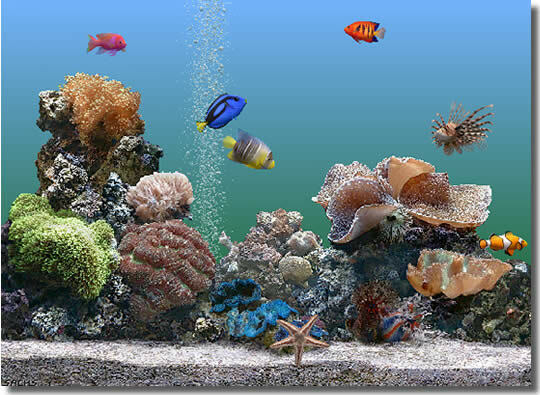 Use SereneScreen Marine Aquarium 2.6 as a screen saver or as a stand-alone program. Any person who owns Marine Aquarium can purchase an upgrade keycode at a special low price.